Today I offer a rather minuscule little tank, almost a tankette, accompanied by two slightly bigger transports. Real live (tm) has a habbit of preventing me from spending too much time on the painting desk, but it's moving along slowly at least. The Panzer I was the first mass produced tank to be introduced into the, then still secret, new Panzertruppe or Panzer Corps. When the German government officially announced the rearmament of the Wehrmacht in 1935 about 150 Panzer I without rotating turret had already been delivered. These first tanks were purely intended for crew training. But after that production switched to the Ausf. A (short for Ausführung or model) which was to be produced till August 1936. The Ausf. A had several design flaws, ranging from an unreliable gearbox to suspension problems. These early flaws were corrected with the Ausf. B. Even at its introduction it was obvious that the Panzer I had no chance whatsoever against most if not all contemporary tank designs. Still it was decided to keep the tank in production first to prepare German industry for mass production of armoured vehicles and second as it was otherwise impossible to satisfy the huge demand for tanks during Germanys rapid build up of the Panzerwaffe. 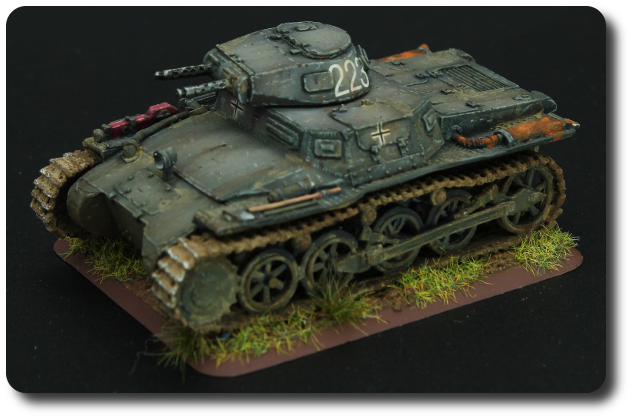 The Panzer I first saw combat during the Spanish Civil War where it was found markedly inferior to the soviet T-26. Nonetheless the experience gained during this war proved invaluable for the further development of the Panzertruppe. Production ceased in 1939 but the Panzer I still saw service as late as Operation Barbarossa. 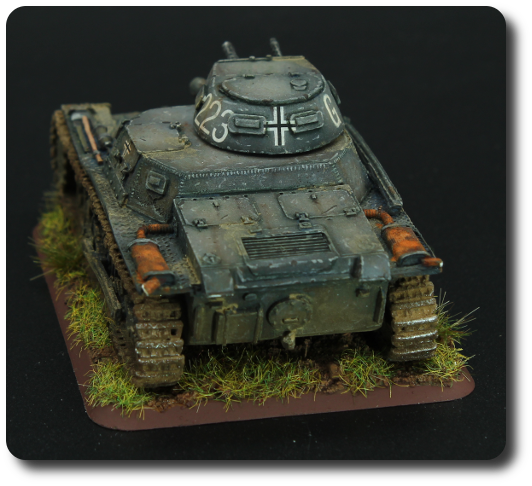 At the end of 1941 though the Panzer was mainly withdrawn from frontline service and relegated to rearguard and anti-partisan duties. 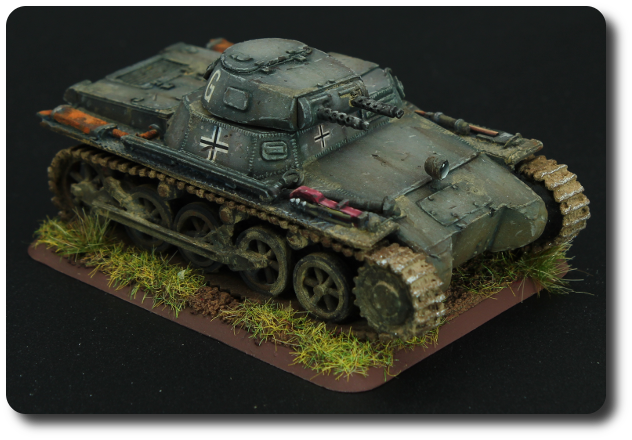 This Panzer I Ausf. A is from the fine folks at Empress Miniatures. It's rather hefty though as it's an all metal model but has some lovely detail like welding lines and such. For stability I added a base as otherwise I doubt it would stand the rigors of gaming. 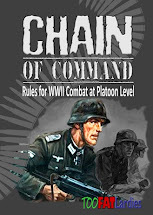 Originally I had intended it to be used with my SCW Rebels but with the recent release of the Blitzkrieg 1940 supplement for Chain of Command my interest in the early phase of WWII was suddenly and fiercely rekindled. 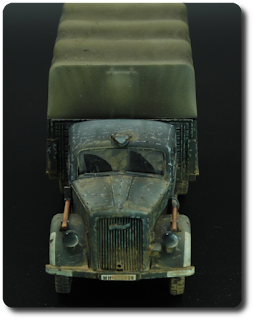 Opel Blitz was the name for a range of medium trucks from 1930 till 1975. The trucks original logo which looks like a stretched "Z" or lightning still forms part of Opels current brand label. 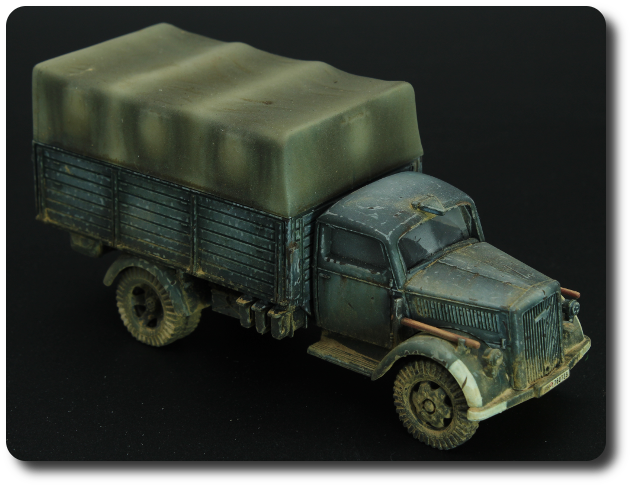 Several thousand of this rugged and reliable truck as well as some variants like the Maultier were produced for the Wehrmacht. 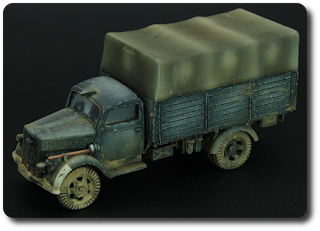 Together with horse carts, civilian vehicles, captured enemy models and a few models from competitors it formed the backbone of German logistics during the war. Despite the popular image of German soldiers riding into combat mounted on halftracks, it was more often the Blitz if not the soldiers feet on which the Landser arrived on the frontline. 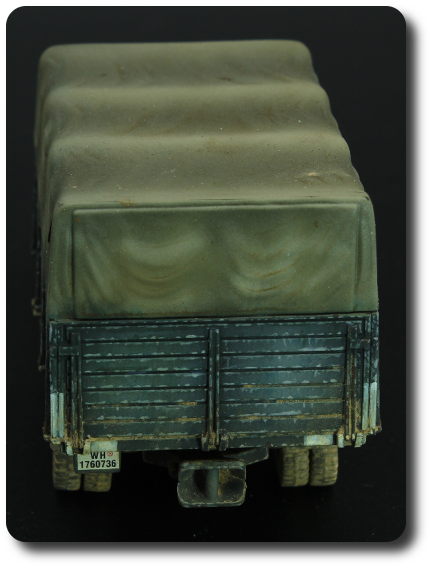 Some formations like the Fallschirmjäger in fact received no halftracks at all and were transported solely by truck. So, that's it for today. Stay safe! Those are just superb as usual Nick! I think we should use the trucks as scenery in some games so they get a chance to see a table. 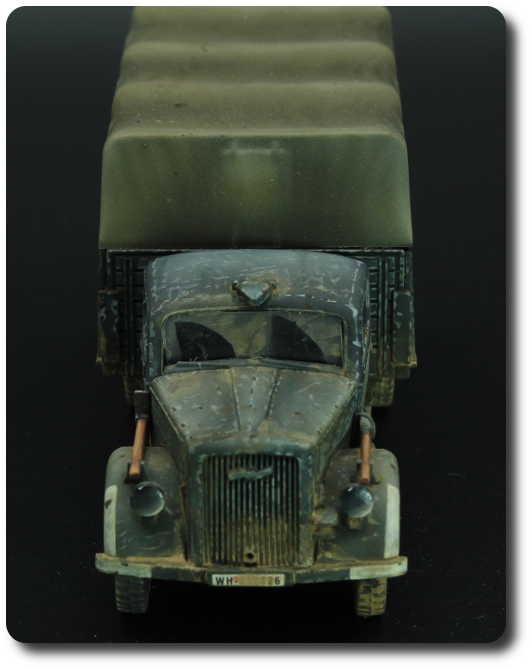 A fantastic and most realistic work, love the windshield wiper's marks...masterclass! Absolutely brilliant! You hit just the right spot with the weathering! I am amazed by the windshields of the trucks with the dust being cleared by the windscreen wipers! Lovely work Niggi, they almost look like the real thing. As John Bond says, they look like the real thing and with the right backdrop it would be hard to tell the difference. 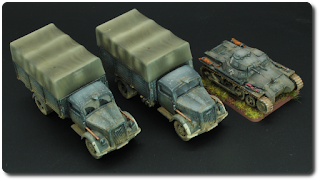 Great work on the vehicles Moiterei. It boggles the mind to think that a little tank like the Panzer I could've played such a role on the Blitzkrieg.